Bring a riot of colors to your garden with this rainbow-speckled recycled glass hummingbird feeder. 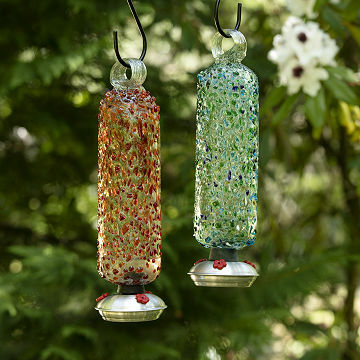 Bring a riot of color to your garden with these speckled recycled glass hummingbird feeders. Hand-blown by artisans in Mexico, each is one-of-a-kind and will vary. Features a dripless stopper in antique brass. Hook included. Handmade by artisans in Mexico. 12" L x 3.75" Dia; 16 oz. Please note: because these use a natural rubber in the stopper, it leaches oil. To help avoid the stopper falling out over time, take a small amount of rubbing alcohol and apply it to the opening of the feeder as well as around the stopper, this will help dry out the oil. This can be done somewhat frequently, or as needed. When filling the feeder, make sure to turn the feeder upside down, fill, then press in hard and slightly twist the stopper into place, then move the feeder to right-side up. Lastly, as the feeder empties, the vacuum seal can be lost, refill the feeder as needed to ensure no nectar is lost. These are stunning hummingbird feeders! When the sun shines through these it's just beautiful! And the birds love them too! This hummingbird feeder is absolutely beautiful! It is a good size and it is obvious the piece is well-made. Perfect for my little hummingbird friends. It is so pretty just by itself. It has attracted many hummers. My brother and his wife bought this for me for a housewarming gift. Unfortunately, despite many tries I could not get the stopper to stay in and each time after a few minutes the metal bottom would fall out and the glass holder would pour out. I'd like to be able to send it back so that my brother gets a refund. This is a very pretty hummingbird feeder, but the stopper pops out if you do not push it in far enough, and gets stuck inside the feeder if you push it in too hard. It is nearly impossible to find the right balance. So unfortunately, I'll be sending this back. She loved it, it's called fire and we're both fire signs. She collects glass art so this was perfect. Haven't used it yet, but it is beautiful. Item is very nice and nice looking. I only gave four stars as we have not tested it yet, so i cannot speak to whether it will work with hummingbirds.